These cookies are my husband favorite, and if he likes them that must mean they are good. I think he just ate four in a row. 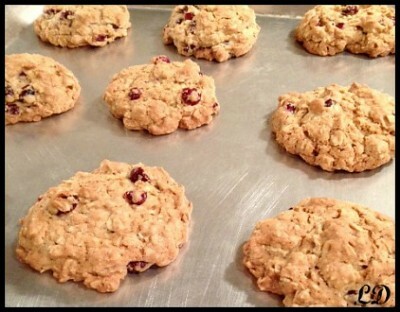 Hard to Please is his middle name, but in all seriousness who doesn't like a soft, and chewy oatmeal cookie? Heat oven to 350˙. In a large bowl, beat butter and sugars on medium in a electric mixer until creamy. Add eggs one by one and vanilla, beat well. In a separate bowl add flour, baking soda, cinnamon, and salt. Mix and slowly add to the wet ingredients. Add oats and Crasins, mix well. Drop dough by tablespoon onto un-greased cookie sheets. Bake for 8 to 10 minutes or until golden brown. Make about 4 dozen cookies. Did you know you can create short links with AdFly and receive money from every visitor to your short links.